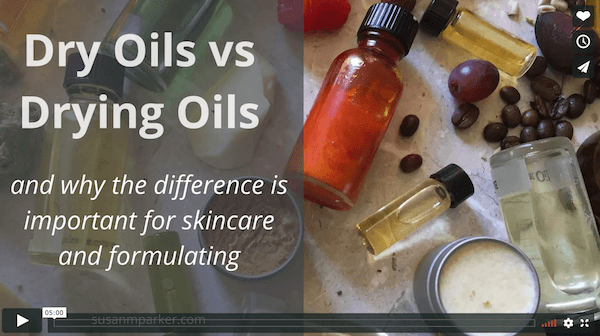 In this short video, I want to show you the difference between dry oils and drying oils. Similar description, completely different oils. Dry oils are a whole group of oils that are good for oily skin formulas, while drying oils include some of the most nutritious oils high in Essential Fatty Acids, but they need special care to keep them from going rancid. I'm a visual learner and I know the video can go by fast, so I wrote up some of the concepts we talked about into this two page resource for you. So if you use camellia seed oil on dry skin is it safe to assume that it could make dry skin much drier? Hi Delilah, I wouldn’t say that it would make dry skin drier but it may toughen it slightly. The dry feel is the oil having qualities of surface protection but without the oily feel. And for very dry skin, there are probably better choices. One of the ways of choosing is to pick plants that grow in hot dry climates with the idea that plants grown under those conditions bring their ability to survive under harsh conditions to the oil. Argan, jojoba, prickly pear, and others fall in this category. Thanks so much for this informative and easy to assimilate explanation of the difference between these types of oils. This knowledge makes it much easier to formulate the best skin care products! Can you mention a few butters that are also ‘Dry Oils’ that you mentioned in the PDF, please? I’m late to watch this; very helpful video. I don’t see the write-up though. Here’s a link to it. This was in the email but didn’t make it to the blog.